L.A. County Sheriff Slammed In Report Alleging Abuse County Sheriff Lee Baca faces what may be the toughest fight of his 14-year political career. A scathing report issued Friday includes accusations of misconduct in his jails, such as deputies beating inmates, cover-ups and a persistent culture of violence. Los Angeles County's sheriff is under fire. 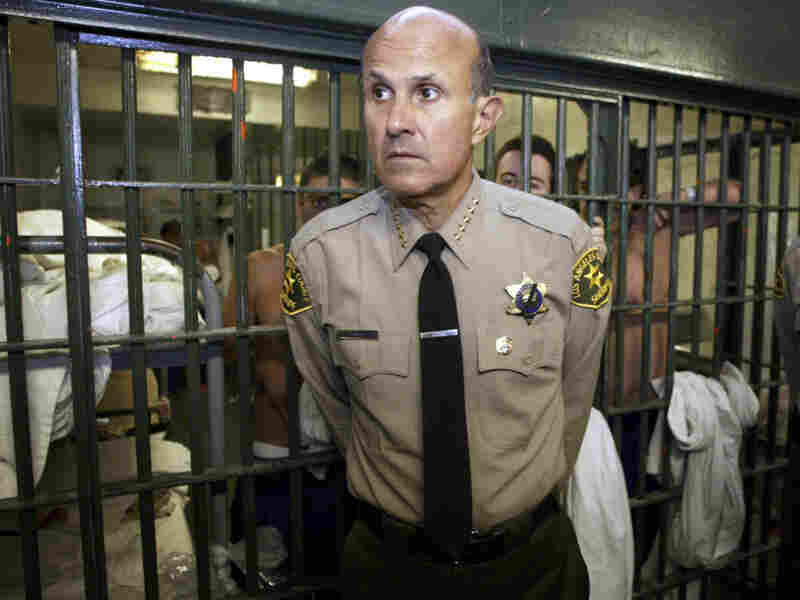 A blue-ribbon commission issued a scathing report Friday accusing Sheriff Lee Baca of failing to address long-standing allegations of inmate abuse in his jails. The accusations include deputies beating inmates, cover-ups and a persistent culture of violence. The sheriff has been able to weather many storms during his 14-year tenure, but this may be the toughest fight of his political career. The L.A. County Sheriff's Department is massive. Along with patrolling one of the largest counties in the U.S., deputies run the nation's largest county jail system, with more than 18,000 inmates housed in eight facilities. According to Friday's commission report, they are failing at the job. "There has been a persistent pattern of unreasonable force in the Los Angeles County Jails that dates back many years," the report reads. Former federal prosecutor Robert Bonner says the problems have recently gotten worse. He and the other commissioners say there is a failure of leadership at the top, with Baca. "The fact is, the sheriff does not seem to be someone as a manager who wanted to hear about problems," Bonner says. "He seems to have had his head in the sand, not minding the store when it came to running the jail in accordance with lawful and sound use-of-force policies." Deputies in the jails have been accused of violent beatings of inmates — several witnessed by jail volunteers, including clergy. They've been accused of participating in secret cliques that glorify the beatings, of engaging in off-duty fights and of supervisors covering up years of excessive force. One current captain in the jail system told commissioners he found a drawer full of discarded complaints and that he was told not to look too hard at other allegations of misconduct. Commissioner Alexander Busansky said Baca told them he was running a model jail. Sadly, Busansky says, that's not the truth. "What I and this commission have seen is not the best in the nation. It is a jail in desperate need of real leadership, meaningful accountability and simple honesty," he says, "leadership that has the tools and the know-how to change the dangerous culture that has been allowed to grow in much of the jail system." Despite the blistering criticism of Baca, commissioners stopped short of asking for his resignation. They did say the current undersheriff, Paul Takana, should be removed from any supervision of the jail. They also made more than 60 reform recommendations, including hiring a national custody expert to supervise the jails and creating an independent inspector general. The sheriff would not comment on the report. His spokesman, Steve Whitmore, says Baca needs to have time to study it but isn't afraid to accept criticism. "He does not look at criticism in a negative way, he looks at criticism as a cornerstone to learn," Whitmore says. Baca has garnered a reputation as a progressive sheriff. He is a Republican in a highly Democratic county, and has been re-elected four times. Raphael Sonenshein, executive director of the Pat Brown Institute of Public Affairs, says Baca is a skilled politician and still has a lot of community support. "I think this moment we are in right now, though, is a different one. I think the sheriff hasn't yet come to grips with the fact that this is different from the other times he's had trouble. This is really a serious one," Sonesnshein says. Unlike L.A.'s police chief, who is hired and fired by the mayor, the sheriff is an elected position. His budget is overseen by the County Board of Supervisors, but only the voters decide his fate. Mounting a countywide challenge to the sheriff is costly and seldom done. Even so, County Supervisor Zev Yaroslavsky says Baca better pay attention to the commission's recommendations. "They can't be ignored, and anybody who ignores them will do it at their own peril," he says. Baca, who is 70 years old, says he is not going to retire. In fact, he says he plans to run again when his term is up in two years.